AFTA accreditation adds an extra positive layer of validity to your business. Fly-tipping is a significant blight on our environment; it’s a source of pollution, a potential danger to human health and a hazard to wildlife. 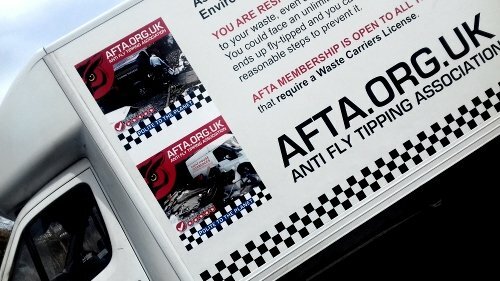 The Anti Fly-tipping association is not just another ‘logo’ to add to your website. It tells potential customers that you abide by the laws under section 34 of the Environmental Protection Act 1990 and your business is part of an association that is actively committed to raising continuous awareness to both the business operator and the consumer to the huge negative social and financial repercussions fly-tipping has on all our communities. Once approved, customers will gain confidence from knowing that you and your firm have been approved to use this accreditation. “Having accreditation that can be checked by our customers makes it easier for us to build trust, and to reach out to potential new customers.” Sophie @ Sophie’s Cleaning Company. Help us to support legitimate businesses. Do not be fooled into a false sense of security, simply because a business holds a valid waste carriers license does not stop that company from engaging in illegal fly-tipping. Fly-tipping undermines legitimate businesses where unscrupulous operators undercut those operating within the law. AFTA members want to demonstrate their commitment to our environment by supporting what AFTA stands for and adhering to our Code of Practice. Reduce fly-tipping by emphatically raising awareness about the large environmental, social, health, legal and financial impact that fly-tipping has on all of us and our communities. Reduce fly-tipping by continually encouraging householders to check before hiring any tradesmen that they are both registered to carry their waste with the Environment Agency, and that they engage in and promote good environmental practices as set out by AFTA. Look for the AFTA Logo. Only our committed members have full use of the AFTA logo, either on their websites, vehicles, or printed documents, to positively broadcast their ongoing commitment to our environment and send out a clear signal to customers that you have been successfully verified. Householders are becoming increasingly worried when it comes to hiring tradesmen who remove ANY type of waste from their premises. They have a good reason to be worried as more and more householders are being traced and prosecuted for not ensuring that the businesses they hired were legitimate. The media and the Environment Agency are keen to highlight these prosecutions. The new regulations on the carriage of waste mean that any tradesman who removes any kind of waste from your property (whether it’s their waste or yours) has to hold a Waste Carriers License. This includes house clearance, man and van rubbish removers, cleaning companies, carpet fitters, plumbers, landscape gardeners, scrap metal dealers, skip hire, builders, and more. As a householder, under section 34 of the Environmental Protection Act 1990, you are responsible for what happens to your waste, even after it has left your premises. Only legitimate operators are allowed to deposit other people’s waste at approved recycling centres. You could face an unlimited fine if your waste ends up fly-tipped and you cannot show that you took reasonable steps to prevent it. In 2016/17 local authorities in England dealt with around 1 million (1,002,000) fly-tipping incidents, a 7% increase from the previous year.